Have you been to Japan? 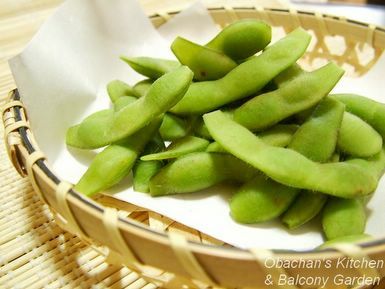 Have you tried the ever-popular combination of beer and edamame (green soybeans) while you were here? Almost all of us Japanese try this combination at least once every summer. (Oh, of course, I’m exaggerating! 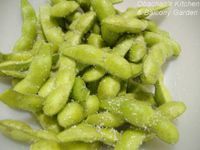 :P ) If you are addicted to this combination as I am, here’s something I want to share with you: tips for tastier edamame from a Japanese TV program and also from bunch of Japanese websites. 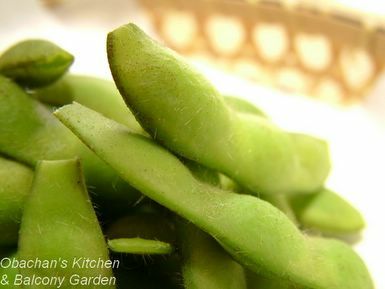 * These tips may not apply to frozen edamame. Sorry! So this must be the golden ratio of edamame boiling. 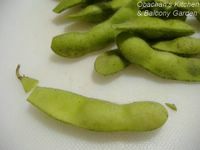 Now, to make your edamame tastier, you need some special preparations before boiling them. Place edamame in a bowl. Take some salt from the 40 g salt mentioned in the recipe, sprinkle all over the beans and rub them well. Do NOT wash off the salt. Heat 1000 mL water in a pot and bring to a boil. Add the remaining salt, edamame and the salt left in the bowl after rubbing the beans, too. The boiling water should be 4% salt solution. Drain and cool by fanning. It is not recommended to dip them in cold water to cool, because it would wash off some salt and make the beans rather soggy. The result: Yeah, I liked the texture very much, but to be perfectly honest, it was a bit too salty for me. So I suppose I need to give a little twist to their golden ratio and use less salt to suit my palate. It’s kind of strange… looks like I’m acquiring taste for spicy food as I get older, but as for saltiness, what used to be OK tastes too salty for me now. These days I can’t eat hiyayakko (chilled tofu with condiments) with straight dark soy sauce. I use wari-joyu which is the mixture of soy sauce and dashi stock. Does this mean that I’m getting old? Ah! I've learned something. Thank you. It's not always easy to buy fresh edamame in the US, although I did see some at the farmers market the other day. I agree with the saltiness. I believe just a little bit of salt in the water goes a long way. I remember seeing an episode of Soko ga Shiritai where a chef from Kyouto prepared edamame. He dressed the beans with a salt solution that he kept in an aerosol bottle, and the preparation of the saline solution was quite elaborate. He boiled sea salt in spring water, skimmed off the impurities, clarified it with egg whites, and strained and cooled it, keeping the concentration of salt the same as that in human urine. He claimed that people unconsciously recall the taste of their mothers' bodily fluids from the womb, so that using a similar concentration in his spray solution produced the best and most natural flavor. Using the aerosol bottle insured an even coating of salt over the beans, and aerated the spring water, enhancing its flavor. very nice tips! will try your way next time. We usually just add salt to the water and dump everything in... Tastes nice also! My oven is broken so I still haven't tried your macha sponge cake recipe - but I look at the picture and sigh with envy. The only edamame you can get here in Israel are frozen. What we do is boil them in lightly salted water and then serve them still warm sprinkled with salt. I use Maldon 'cause the texture is more interesting and more delicate than the regular coarse salt that restaurants serve them with, table salt melts too quickly, so only really tacky restaurants use that. Congratulations on your new camera. What kind did you get? Oh, now I’ve learned something, because I didn’t know that fresh edamame was available over there. And you’re exactly right about bar owners serving salty foods. We did the same thing at the izakaya where I used to work at. OMG, that sounds a bit too much for me. I wonder how much they charge for that elaborately boiled edamame. Good luck. Let me know how you liked it. Yeah, I think the salt really makes a difference. I don’t like the real cheap table salt they sell here in Japan… it doesn’t taste good at all. BTW, my new used camera is Fuji Finepix. It has a better continuous-shooting function than my old camera, so should be good for taking photos of dancers. I LOVE edamame, although I'm not really fond of beer. :) I have yet to try to make edamame at home, but thank you for the 4% tip! I'll be sure to remember that if I do attempt it. Now I'm craving for some to munch on! Hey Obachan! It's been awhile since my last post. Edamame and beer what a winning combo! When me and my friends go out drinking and we have edamame, we dip it in a shoyu and lemon mix. Please try it and let me know what you think. Mmmm, I had never had them before coming to Japan. Now I am hooked. I’ve been wondering what kind of drinks other than beer would go well with edamame. We are so used to eating them with carbonated drinks with or without alcohol (mostly with alcohol), but my mom who can’t drink alcohol at all loves them with iced barley tea. Hi! So nice to hear from you again. Your idea sounds interesting but how do you actually do that? I mean, you take the beans out from the pods and dip in the sauce or you dip the pod to the sauce and taste it as you squeeze the beans our with your teeth? 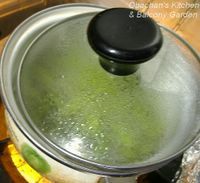 Weekend herb blogging? That means you are growing edamame at your place? I envy you! BTW, did you buy the kaiseki book? Heh heh - not growing, only buying. I cheat. But it gives me agood chance to investigate a little deeper into the ingredients I know little of. Book - not yet. Thanks for reminding me!!!! Just dip the whole edamame in the "sauce" before you bite the shell to get to the soybean. I love edamame with beer... unlike Japanese people, I don't restrict myself to only the summer time. I think beer and edamame are good all year round. 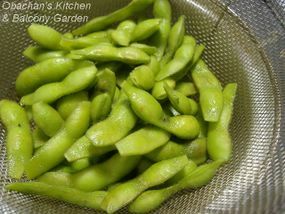 My hubby and I are sure to have a beer and edamame when we have Japanese food... I guess it reminds me of my year in Japan. Thanks for the 4% tip. Now, I'm on the lookout for fresh edamame! Thanks. I’ll give it a try next time. Wow, one of my favourites which becomes even more so after seeing this recepie and these wondeful pictures. Which camera do you use? Sesame oil! Mmmm… It doesn’t sound like a bad combination, but I agree. Simple salt would bring out more of the delicate beany flavor. So you have edamame in Sweden, too? Wow! I use Fuji Finepix. It’s not that I’m a fan of Fuji camera, but when I pick the one with all the functions I want and with the friendliest price tag, it’s often fuji. You inspired me to make some edamame. I cut off the ends and rubbed them with salt and rinsed them, then I boiled them for 3 minutes in 2.5 percent salt water. Thanks for sharing the result of your experiment. Since 4% was a bit too salty for me, I might try rinsing the edamame after rubbing them with salt, like you did, and boiling in 3% salt water, maybe. Did you cut off the ends with a knife? I used scissors from 100-yen shop and didn't have the problem of the hard strings coming off. My father would buy huge amounts of fresh ones every season as well as peanuts that he boiled. It's amazing how cheap and bountiful such treats used to be. I remember them hot from the pot even after a cooling rinse. Greetings from North Carolina! While the so called "Asian Cuisine" available in restaurants here is an utter abomination to all mankind, we are blessed with living right next to a 20 acre field which, at the moment, is planted with ripening soybeans! My youngest son (4 years old) adores edamane and I was hoping to locate a good recipe. Thank you so very much for sharing! So great to hear that you can get fresh edamame over there! I thought maybe people outside Japan can get frozen ones only, but no way. Gee, I can see the “real world” through blogging and I love it so much.